You might have noticed a little drier, cooler feel to the air on Thursday morning. Unfortunately, that is about it in terms of relief provided by this week’s cold front. Today and Tonight: Today will be mostly sunny and warm with high temperatures climbing into the low 90s by early afternoon. While light, north winds will keep oppressive humidity at bay, it will not feel cool thanks to the absence of clouds and showers. Overnight will be clear with calm winds and lows in the low 70s. Up Next: One more comfortable morning is possible on Friday before moisture returns to the region. At first, this will be noticed via increasing humidity. Eventually, enough will be around to trigger afternoon showers and thunderstorms again by the end of the weekend and early next week. Very little change in temperatures is expected other than increasing lows by a degree or two by early next week. The Tropics: A tropical wave set to move off of the African Coast will encounter slightly more favorable conditions for development in the deep tropical Eastern Atlantic and is given a 20 percent chance of formation by the National Hurricane Center. Elsewhere in the Atlantic Basin, all is quiet. In the Pacific, Hurricane Lane is a dangerous category four storm that is threatening Hawaii. 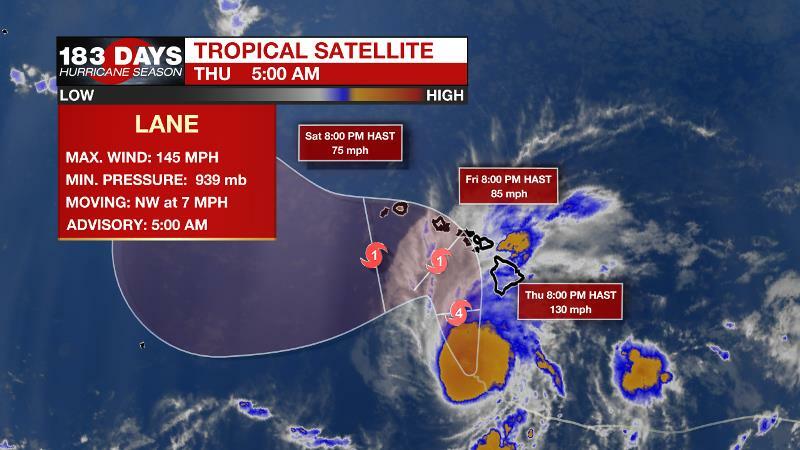 Lane will move just west of the main islands Thursday through Saturday. While maximum winds of 145mph may decrease a little, serious hurricane force winds, large swells and 15 inches of rain are expected. A major hurricane has not made landfall in Hawaii since 1871. An upper level ridge will build over south Texas providing more of an influence over the local weather than a trough exiting the Southeastern U.S. The cold front that passed through on Wednesday is weakening over the northern Gulf and will possibly retreat north as a warm front to the Louisiana Coast over the next few days. Dew points have bottomed out in the upper 60s and that is as low as humidity will go because of the front. Slightly less humid conditions may continue through Friday before return flow puts an end to that. Subsidence beneath the Texas ridge should continue to limit convective development. Forecast models leave the upper level ridge in place through much of the weekend, which will serve to keep temperatures seasonably warm. The position of this ridge will be important. A slight shift to the north, as suggested by the ECMWF model, would allow some weak, easterly waves to cross the Gulf Coast and generate showers and thunderstorms by Monday and Tuesday.